30/11/18 – Bubbles has been adopted! Hooray! 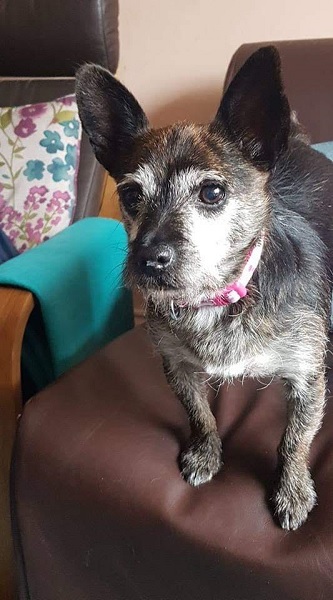 Bubbles is a tiny 8 year old terrier girl – she only weighs 5kg – who is with Helping Pets North East, in a foster home in Newcastle Upon Tyne, after being found as a stray. Despite being microchipped, poor little Bubbles was not claimed. This sweet little lady is a happy girl. 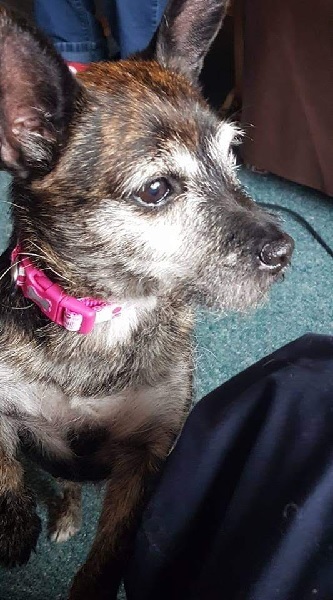 She is good with children and is totally unfazed by the greyhounds in her foster home, but she does get possessive of ‘her’ person if she is on their knee and other dogs approach. It seems that Bubbles hasn’t had much exercise previously but she is loving going out for walks now. She has met a few dogs when out and about, with no problems. At night she sleeps quietly in her crate at her foster home. Bubbles has just been spayed and once fully recovered she will be vaccinated. Could you offer Bubbles a lovely new home? Contact Helping Pets North East by filling in their online Adoption Form. Please mention that you saw Bubbles on the Oldies Club website.